Lately Room 11 have been painting kowhaiwhai for Matariki. 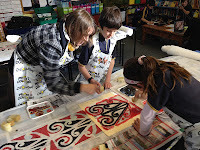 The kowhaiwhai have been painted on a huge piece of frost cloth. Each design took about 10 minutes and the whole kowhaiwhai took roughly a week to finish. Once we had finished they were strung up in the hall and it looks great!